In 1989, Red Sail Sports said "Bonbini" ("Welcome" in Papiamento) when we opened our first retail store at the Hyatt Regency Resort. We've been there ever since. Because of the popularity of scuba diving, catamaran sailing, and other water activities on Aruba, Red Sail Sports quickly identified this growing trend and became experts in the field of watersports recreation, while continuing to expand our retail stores as well. In the past 13 years, we've added nine more retail locations and have established three full-service dive and watersports centers - one at the Hyatt Regency Aruba Resort, the second at the Aruba Marriott Resort, and the third at the Renaissance Aruba Beach Resort. With our expanded dive and watersports centers, we've been able to serve more of Aruba's active vacationers. To accommodate the growing tourist population, Red Sail Sports Aruba also expanded its fleet. 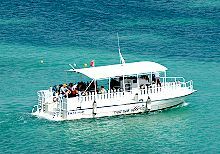 We now proudly boast the island's most modern dive boats - the 48' Pasa Bon can accommodate up to 24 divers, while the Vista Mar can hold up to 24 divers. We also have three luxury catamarans - the 70' Rumba is the newest addition to our fleet and is the island's largest sailing vessel, accommodating up to 125 passengers. This state-of-the-art catamaran was custom built by Gold Coast Yachts to our specifications at a cost of over $650,000. 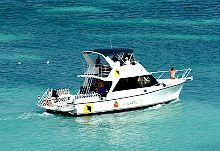 The Rumba is Aruba's most expensive and luxurious catamaran operating in Aruba. The 62' Fiesta was also built by Gold Coast and provides seating for up to 90 passengers. The 53' Goza seats up to 50 passengers. 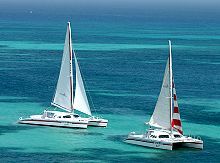 Our fleet of luxury catamarans departs daily on the turquoise waters of Aruba for scheduled sails and as well as private group functions. 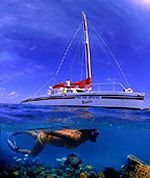 We offer snorkeling, sunset, dinner sails, Night of Green Iguana sails and moonlight cruises.